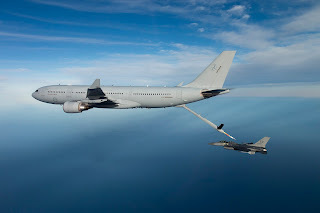 SINGAPORE, -- Airbus Defence and Space (DS) expects that the next new Airbus A330-200 Multirole Tanker Transport (MRTT) will be delivered to either the Republic of Singapore Air Force (RSAF) or the French Air Force. "The next [MRTT] is either [for] Singapore or France," Fernando Alonso, Head of Military Aircraft at Airbus DS, told reporters in Kuala Lumpur in early August. "Australia has bought two additional ones. Those are something quite special as they are second-hand ones," he added, referring to the two former Qantas-operated A330 airliners that are being converted into MRTT platforms by Airbus DS. However, he did not provide exact time frames for the deliveries. The Royal Australian Air Force Airbus A330-200 / KC-30A Multi Role Tanker Transport (MRTT).